Bulbous nose, which is commonly seem type of nose in Asian, usually has short, round and low nose tip and wide alar. 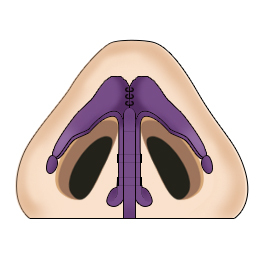 Due to funnel shaped nose, the alar base is widened and the nostril shape is altered. Excessive widening of alar base makes patient look older. There are various causes to bulbous nose; when nose tip cartilage is formed widely, when alar cartilage is excessively developed, and when there is excessive skin tissue on nosal tip and ala. Bulbous nose can be corrected with comprehensive procedure of nasal tip plasty, alar rim base reduction. Bulbous nose correction is mostly combined with nose bridge (nasal dorsum) augmentation for more satisfying result. Bulbous nose is mostly caused by the round and blunt nasal tip. Hence, bulbous nose correction requires comprehensive nasal tip plasty. Bulbous nose usually developes with low nose bridge, so combination of nasal dorsum augmentation is usually recommended along with tip plasty. Since the correction requires comprehensive nose surgery, it is important to consult and receive the correction procedure with nose plastic surgery specialist with profound experience and aesthetic sense. Portion of alar cartilage will be removed and sutured to collect alar cartilage together to the center to give refined shape to nasal tip. 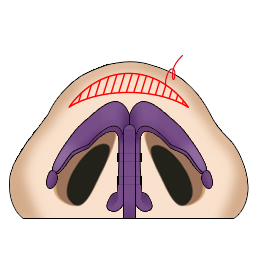 Alar cartilage will be collected and sutured to correct nasal septum to higher and upward position. Additionally, implant and ear cartilage can be used for the nose augmentation. Excision will be made on excessive skin and fat layer which covers the alar cartilage. In case when the alar cartilage is small, ear cartilage or nasal septum cartilage can be used to create the defined and pointier tip. The technique for controlling lateralization of the ala can be divided into 3 methods, including the Alar base cinch suture technique, excision on the lateral part of alar wings and concentrate them into inner side, and excision on the skin on the alar based and the lateral part of alar wings and cut them into right size and suture them for suitable width.